Banners are always needed. We see them everywhere. Indoor & Outdoor. At shopping malls, gas stations and sporting events. 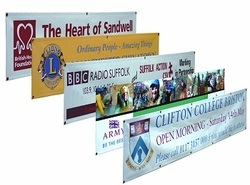 We have various banner solutions to meet your needs. 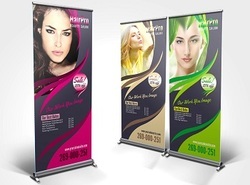 Select your banner and get a FREE visual mock-up. Easy to set-up, convenient for any event, the roll-up retractable banners are great to show case your brand. Any size you need. Just tell us what your size and we will get this done for you. Chose as many grommets as you need. We have awesome shaped pop-up banners. Great for sporting events such as golf, soccer & basketball.